‘Off-track’ (or cross-country) bushwalking in W.A.’s conditions has minimal, if any, impact on the environment. Worn tracks rarely develop nor need developing. The varying routes chosen by walkers along the walking ‘corridor’ of an unmarked, undeveloped trail typically leave no trace. Routes suggested on WalkGPS (and some in “Forests on Foot…” , 1985) have been walked by numerous walkers for many years, without informal trails developing; with no evidence of trampling of vegetation along the off-track sections; and without even a trace that walkers have passed through. GPS navigation is needed to follow these established cross-country routes as there are still no tracks apart from pre-existing animal tracks (from kangaroos and wallabies, emus, feral pigs and goats). The pressures on any one route are nowhere intense and do not suggest that formal track development should ever be required to avoid unintended over-use impacts from long-term activity. Despite the popularity of some routes, the cross-country walking activity is demonstrated to be sustainable. The eucalypt forests and woodlands of the Perth region are mainly relatively light and open and the ground is mostly firm or rocky; generally ideal for cross-country, minimal impact bushwalking. 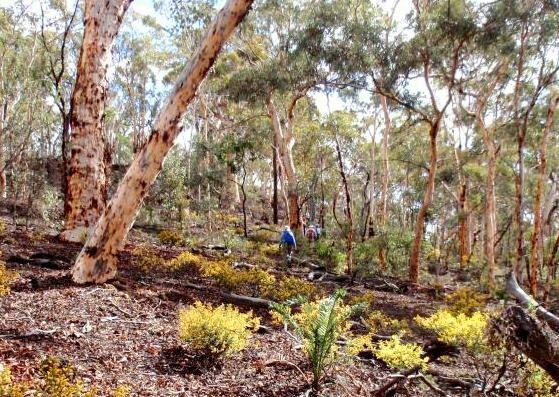 ‘Bush-bashing’ is not required; No walker wants to push through an occasional dense patch of shrubland, such as Prickly Moses (Acacia pulchella) or Pingle (Banksia squarrosa) – nor to step onto a concealed snake! The routes on this website most often bypass sections of scratchy shrublands and heathlands which are more common around the granite outcrops, but well worn animal trails (mainly from kangaroos and wallabies) also provide an easy, non-scratchy way through. There is also the option of a small deviation into more open forest. Protecting your legs with gaiters or trousers will avoid scratches. Wherever possible on the granite outcrops keep to the bare rock surfaces to avoid damaging the fragile moss-covered areas, but also avoid the darker-stained patches of rock which often become treacherously slippery when wet. Also, do resist any temptation to build or add to, rock cairns; Moving loose rocks on the outcrops destroys precious habitat and cover for an array of wildlife, including geckos, and crevice dragons, plus scorpions and smaller invertebrates. Follow good bushwalkers’ standards to minimise your impact on the environment, including leaving behind no traces (including no rubbish), and ensuring good bush hygiene and sanitation. Good bush hygiene includes not spreading Dieback. Ironically the absence of worn ‘trails’ in popular traditional bushwalking areas in the Darling Range, and the previous lack of published ‘route’ maps for most areas, has in the past mistakenly suggested to some that the areas are seldom visited. Those interested in continuing traditional bushwalking in the region need to ensure our State’s policy-makers, EPA and land managers fully appreciate the special continuing recreational amenity value of these areas for the community.